So how do you integrate enterprise strategy and corporate performance into an agile delivery model? 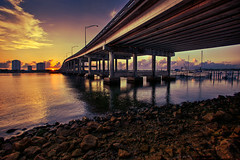 On one hand, the enterprise strategy and corporate performance require stability, predictability, and a high degree of structure, much like the Blue Heron Bridge in Singer Island, Florida. On the other hand, agile techniques are extremely useful with adjusting and reacting to uncertainty by creating highly collaborative environment and pushing decision making into daily scrum meeting / calls between project stakeholders. In my experience and discussions with companies and teams in this space, many view this as a holy grail. The article linked above by Tamara Sulaiman at Gantthead does a fine job of positioning a classic organizational capability, an Enterprise Project Management Office (EPMO) within an agile construct, and offers several ideas on how to make it work. In particular, what I like most about this article is the clarity around specific activities and capabilities that could be put into place to make an Agile PMO live within a company. The most interesting capability in the Agile PMO is the meta-scrum. The article go on to say "the Meta Scrum is focused on the strategic planning and decisions guiding the program or programs as a whole. Establishing a Meta Scrum with the PMO representative acting as ScrumMaster to plan and facilitate meetings (as well as reporting and tracking decisions and action items) can add significant value in having a program able to rapidly respond to change while staying true to the corporate strategy and objectives." Articulate your strategy in a manner that is culturally acceptable for your company. Decompose the strategy into a series of initiatives / programs / projects / sprints that can be understood by your company with traceability from the top of the company down to the first line employee. Establish enough of a management system that embraces agile concepts at the daily execution level while gathering the basic information that will allow you to answer the hardest strategic level questions from your CEO. Basic elements that I propose include but are not limited to: corporate goals, programs / projects / sprints / tasks, employee hours worked on a weekly basis, & capital vs expense delineations. Define and allocate executive level ownership of the corporate goals, programs, projects, sprints, tasks and associated budgets to move decision making as close to the source as possible. Tooling to implement your management system so that you are not running your business in Excel spreadsheets. In the end, you want to create a corporate ecosysem, think of this as a culture and management system, that mimics the structure and stability of the Blue Heron Bridge (aka the enterprise) while allowing the daily variability and agility of the underlying ocean of change to ebb and flow (the people, programs, & projects). Are you a Purpose Maximizer or Profit Maximizer?